Was the week to try something new and these were a hit! Den said he would have these again ANY day! 1. To prepare coleslaw, combined first 9 ingredients in a medium bowl, stirring with a whisk. Add coleslaw; toss to coat. Cover and chill. 2. 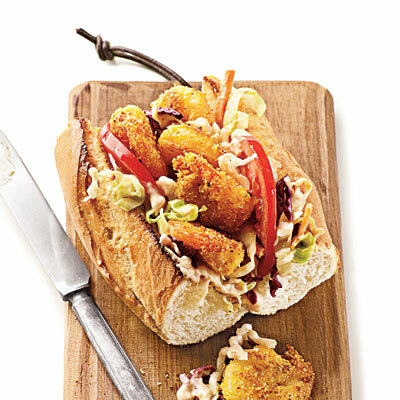 To prepare Po'boys, combine cornstarch and next 4 ingredients (through egg white) in a medium bowl; whisk until blended. Add shrimp; toss well. Marinate in fridge 30 minutes, stirring once. 3. Hollow out top and bottom halves of bread, leaving a 1/4 thick shell. Place torn bread in a food processor; process until very fine crumbs. Set aside 1/2 breadcrumbs; reserve remaining bread crumbs for another use. Combine 1/2 breadcrumbs, cornmeal, and black pepper in a large zip lock bag; seal and shake to combine. 4. Remove shrimp from bowl; discard marinade. Add shrimp to breadcrumb mixture. Seal and shake to coat. 5. Heat large skillet over med-high heat. Add oil to pan; swirl to coat. Add shrimp; cook 3 minutes on each side until done. Do not overcook!! 6. Arrange 1/2 cup coleslaw on each bottom half of bread. Top with shrimp and tomato slices. This is a light and super easy dish that's great for summer or any time of year. Score fillet from one end to the other 3 times. Fill scored sections with softened butter. Fill scored sections with softened cream cheese. Cover entire fillet with mushrooms pressing firmly into scored sections. 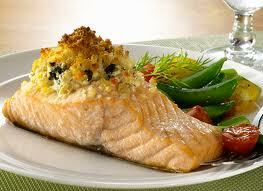 Drizzle with lemon juice and sprinkle with season salt. Grill or broil for approximately 15 minutes. We made this on Father's Day - it was fantastic!!!! 1/2 ounce Romano cheese, shaved. Combine juice, oil, and honey, stirring well. Drizzle dressing mixture over fruit mixture; toss gently. Arrange Arugula or Spinach on a platter - or you can do individual plates. 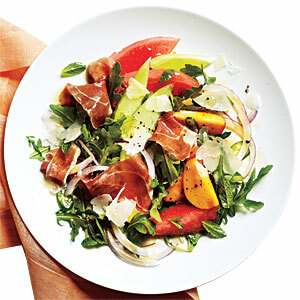 Top with fruit mixture, then Prosciutto, then cheese. *You can add one VERY small minced serrano pepper to the fruit mixture, but it makes it VERY hot. 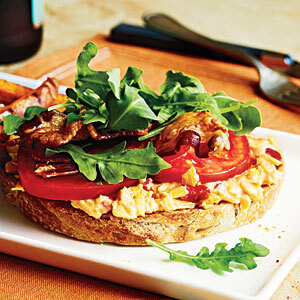 Put a new twist on the ole BLT! Spread 3 T cheese mixture on each bread slice. Top each with 2 - 3 tomato slices. Top each sandwich with 2 bacon halves and 1/4 Arugula or Spinach.